Recommended to: Readers who enjoy stories centered around television stars and celebrities. 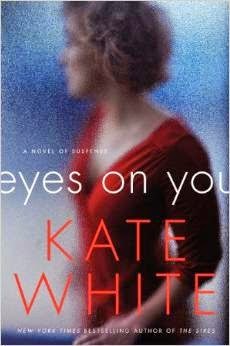 Eyes on You is billed as a "riveting psychological suspense" in the synopsis. I can't honestly say I was convinced of that during this read. There are things about Kate White's newest story that are done well. The writing is solid and the blinding glamour of television celebrities is evident. It's just that I never really felt the suspense that I was promised. Let me explain. First off, it's evident that White once wrote for the world of fashion. The opening page of Robin's story puts that front and center, as she describes a brand new pair of heels she's donned for a book launch party. Rather in-depth. See, Robin is caught up in the life of a celebrity. A television personality, and a successful author, her life revolves around being known. She's used to being in the spotlight, loves the validation that comes with the job, and she's not shy about it. It is this very fact that puts her in the cross-hairs of a mysterious enemy. That being said, most of the book really is dedicated to Robin's life. Instead of the promised suspense, which is only mildly peppered in, the reader is treated to lavish parties, sumptuous dinners, and illicit affairs. I found myself skimming forward in an effort to finally get to the next piece of puzzle. I wanted less Robin, and more mystery. Even the actual events that took place to make her feel like she was being stalked drove me a bit mad. They weren't edgy, or exciting. Which made the ending of this book feel like it came out of left field, and not in a good way. I'll admit that this book is well-written. The characters are fleshed out enough to love or hate, the lifestyle is described in all its glory, and Robin is an interesting enough protagonist. The problem is that this never felt like psychological suspense. I never felt worried for Robin. I never felt nervous about what might happen next. This felt like a story about a woman who has made it to the top, and is afraid to let it slip. Bill it as that? I'll take it. Bill it as a suspense novel? You haven't quite hit the mark. So, three stars to Eyes on You.